— Updated on July 2 with *expansion plans and **pricing scheme. Lincoln celebrated becoming a wireless city on Thursday, July 1, as a new city-wide Wi-Fi network has now been launched. The new wireless network, identifiable by the name Wireless Lincoln, claims to offer on-the-move Internet at speeds of up to 10MB across the city. However, specific details of where the WiFi network would be available were not explicitly specified. Lincoln’s wireless network has been a long time coming, with the project having been in planning stages for more than a year. The service, which is now finally a reality, has been made possible by AB Internet, the University of Lincoln and original project planner Lincoln BIG. 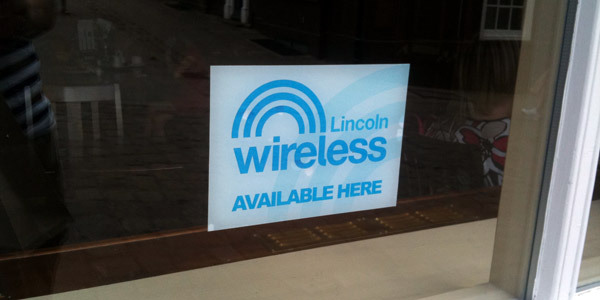 Wireless Lincoln was launched at an event in the cities Cathedral quarter on Thursday — bringing old and new together. The event also saw the wireless network demonstrated live to members of the public. “The response has been quite overwhelming. The range of enquiries has shown us just how much demand there is for a flexible and cost-effective metropolitan wireless network and it’s a real vindication of the philosophy of the original project champion, Lincoln BIG,” said Darren Round from AB Internet. With the service now live, plans are already in place to expand the network further, *with up to 50 Wi-Fi hotspots throughout the city. AB Internet said they are now three-quarters of the way towards their target. Shops in the city centre are displaying a sticker in the reception area. **To use city-wide Wi-Fi, you will have to join the Wireless Lincoln SSL ID, and register with your name and email address to obtain a username and password. The service however, will be free of charge for only 15 minutes every 24 hours.